Lottery lovers from Canada and across the world have the chance to hunt for another giant European jackpot of up to $132 million every Friday. Choose 5 numbers from 1 – 50 and an additional two EuroNumbers as you join in with the rest of Europe every Friday in the hope to become the next multi-millionaire. With the DoubleJackpot feature you could make yourself twice as rich as your jackpot win will be doubled – up to a massive $265 million. Friday has become the day of jackpots as players from over 14 European countries all pool together for the Euro Jackpot, awaiting the draw in Helsinki that takes place around 20:00 (around 13:00 EST time). By the start of the weekend, you could be celebrating becoming a millionaire! The EuroJackpot was designed to give players across Europe a better chance of striking the jackpot in comparison to the EuroMillions lottery. The odds of winning EuroMillions is 1 in 117 million exceed the odds of winning the EuroJackpot at 1 in 95 million. The EuroJackpot can rollover to a maximum of around $134 million! 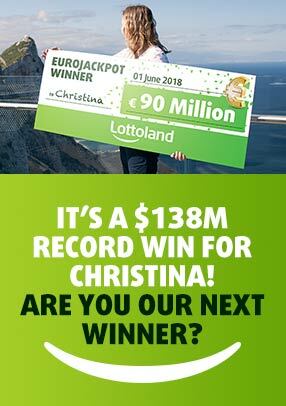 Now you can increase your chances of winning at Lottoland with our quick and convenient Combo bet that allows you to select more than 5 main numbers & 2 EuroNumbers in a field. Our play slip will automatically combine all the different possible lines, a perfect solution for lottery syndicate players who all want to choose their own lucky number. Have you played EuroMillions yet?